Dan Fagin • Bantam, 2013, 538 pp. In 1952, the Toms River Chemical Plant opened a vast factory in rural New Jersey, dedicated to making dyes based on a coal product, anthraquinone. Prized for bright, color-fast colors, the manufacturing process also produced prodigious streams of toxic waste. As the plant, eventually renamed Ciba after its owner, the Swiss chemical giant, prospered, streams of waste filtered into the sandy soil and reached the Atlantic through a leaky pipe. Less obvious at the time, a field of municipal water wells a mile or so from the plant fence were contaminated by midnight dumping of barrels of toxic trash from chemical giant Union Carbide. You might guess the outcome: A cancer cluster, a town divided against itself, a massive struggle pitting people who felt victimized against a truculent, entrenched corporation. Caught in the middle: state and federal regulators. Toms River details the decade-long effort to unravel and repair the environmental damage left by the Ciba plant, which closed in 1996. It explores the 1856 discovery of a bright purple residue that “clung flawlessly to a cotton cloth,” and the rise of the Swiss chemical industry, together with its constant need to dispose of toxic byproducts. 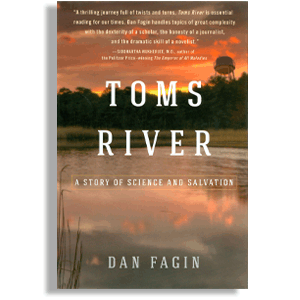 In parallel, author Dan Fagin describes the fitful progress of toxicology and epidemiology — disciplines that were tested so strongly at Toms River. The signature ailment at Toms River, childhood leukemia, afflicted families living near the plant. Repeated investigations of this “cancer cluster,” however, could not quite pin down the source. Although there was obvious aquifer pollution, nobody had stored samples of past drinking water, so it was impossible to know how much poison they contained. Toms River the book is anything but unsatisfying. Fagin weaves — without a bit of maudlin grandstanding — strands of chemical invention, corporate behavior, dedicated doctors, nurses and especially citizens, family tragedy, and the invention of epidemiology. The result is a stunning achievement: A historical-scientific page turner, all fact, all the time!